This post is not for the faint of heart. Or, maybe, well, not for the faint-of-heart-turkey-animal-rights-activists out there. I have a photo or two in here you might want to just … you know … skim past. This year, I am in Brussels. For the first time in my life, I worked on Thanksgiving and I shared Thanksgiving with complete strangers. 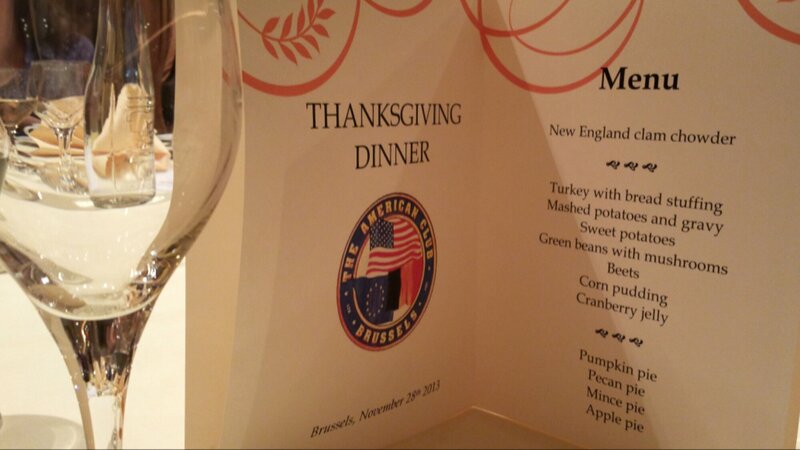 I will say, though, I chose a kick-a** Thanksgiving Dinner to attend. I haven’t had THIS much fun in a seriously SERIOUSLY long time. I made a few new friends (hopefully they still like me after last night), one of which is an “Eastern Belgian” and his gal, a North Carolina professional, working internationally. Then, there’s Nelson and Mary Jane from Philly, and Michael from San Francisco! Then, then, then! We have Lauren, another lawyer, and Amy, a five-year resident of Brussels with a love for cooking. I was in great company! First up: the hosts. As many of you know, I am on the Board of the World Affairs Council of New Orleans. In that role, I do a myriad of things, not the least of which is eat good food and drink amazing beverages under the auspices of “work.” 🙂 When I got here, one of the first things I did was look up the equivalent of my organization. Yes, you’re right: I Googled “american” “world affairs” “brussels” … and voila! The American Club of Brussels. I perused a bit, thought about joining, and then I did! Next up: the events. The ACB is much like our WACNO, with a few twists. Namely, they’re in ANOTHER COUNTRY, and of course, their purposes are more aligned with connecting people rather than educating people. 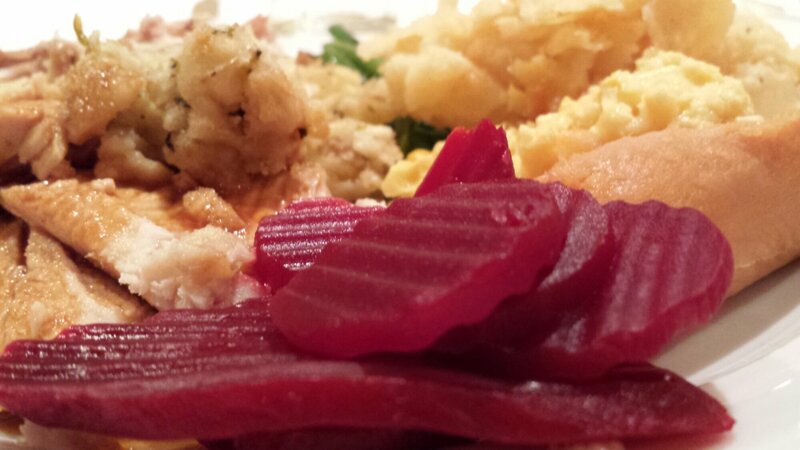 But, when I saw Thanksgiving Dinner was an option, I was in. More than that, when I saw how reasonably priced it was (considering I have no oven and no American friends here), I signed up. Third: the venue. Did I ever mention that I am an SPG girl through and through? Oh, I didn’t. Hm. Let’s rectify that. Listen up: I. AM. AN. SPG. GIRL. SPG = Starwood Preferred Guest. In other words, I only stay at the Sheraton, Four Points, Aloft, Westin, W, Le Meridien, etc. I even stayed at the King Edward in Toronto a few years back. I gave up any other hotel chain a looooooong time ago. In fact, it was the summer of 2003. I was in Kona, in Keahou Bay, Hawai’i. It was the most magnificent resort, and I could swim with the manta ray. It’s also where I learned about the “Sweet Sleeper Bed” and where I became addicted to down feathers. I immediately went home from that trip, started planning the second trip (that was in 2004), and went straight to the store to buy down pillows, comforters, bed pillows … the works. I had never experienced such lovely amazing sleeps in my life. But I digress. 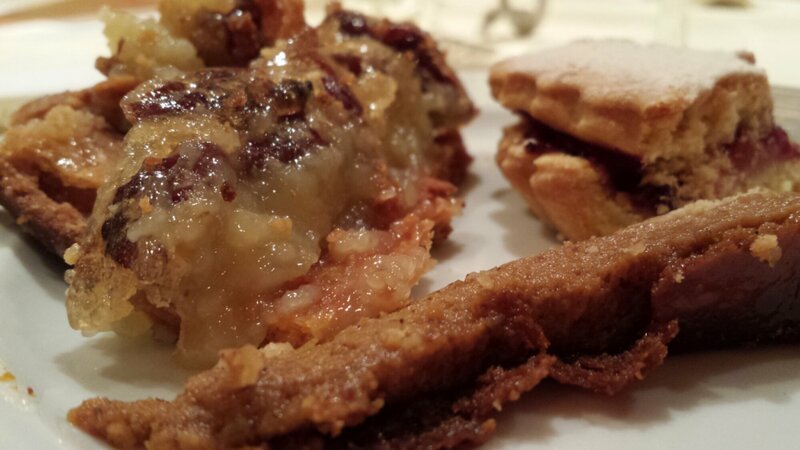 When I saw that the Thanksgiving Dinner was at the Sheraton Brussels, I thought to myself, “Yes, indeed. You know it. I’m in!” I was lucky enough to meet the Hotel Manager, charming kind, warm and thoughtful, Palmer Colamarino. We swapped stories and he promised to introduce me to the Chef sometime. I sent him an email and lo and behold, he actually responded! Hopefully, I’ll meet up with him and the Chef after the holidays. I also promised him that I would write beautiful things about my experience, and here we are. 🙂 In all seriousness, though, the food was ungodly tasty and the servers, extra kind. They said that out of 10 tables of 8 people each, we were the happiest and having the most fun. It was great. Those lovely servers even went so far as to compliment me on my hair. Now, that’s service! So, here we go … onward! First, you make a roux. Oh wait. 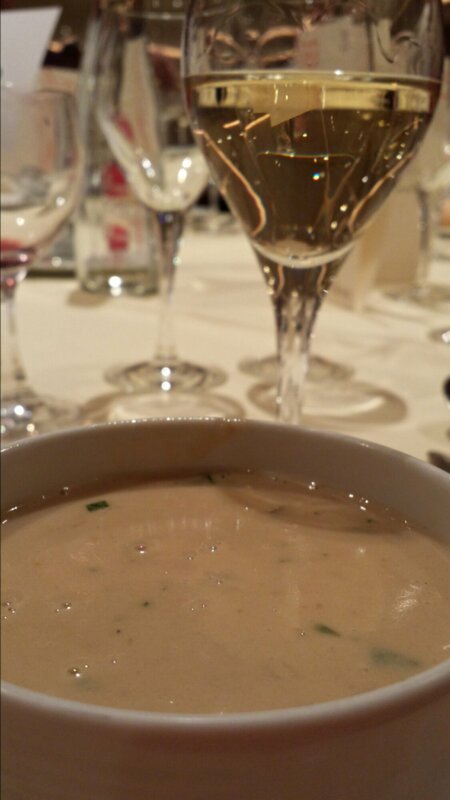 I meant, first you make New England Clam Chowder and pour yourself a glass of wine. 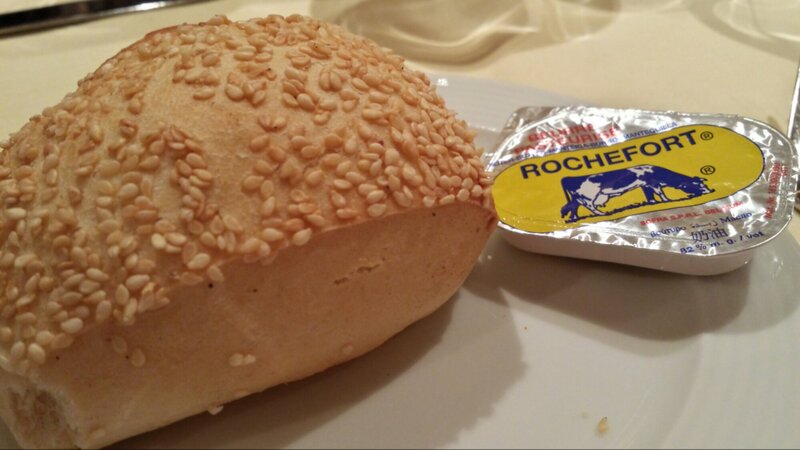 And to accompany that soup, bread! And REAL BUTTER. Oh my. 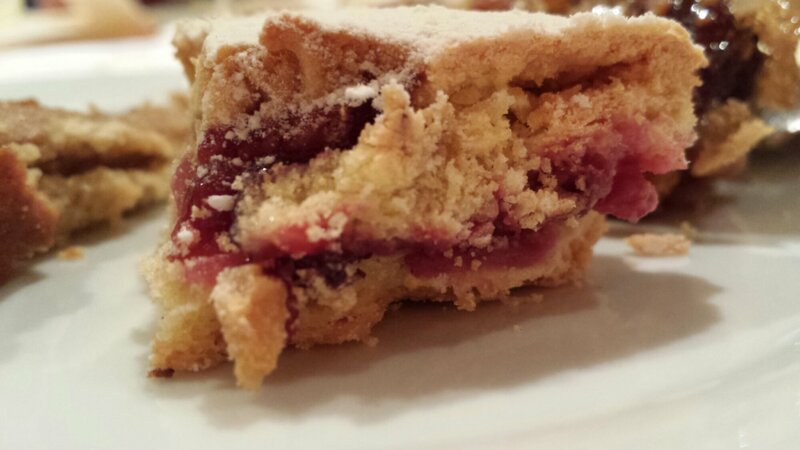 Mince pie! I’ve actually never had mince pie in my life. I have no idea why not. That was SO good! I have to say, this is quite possibly the most amazing meal I have eaten in quite some time. SO MANY KUDOS to the Chef at the Sheraton, and for those who offered up their home recipes for our meal. I’m not kidding. 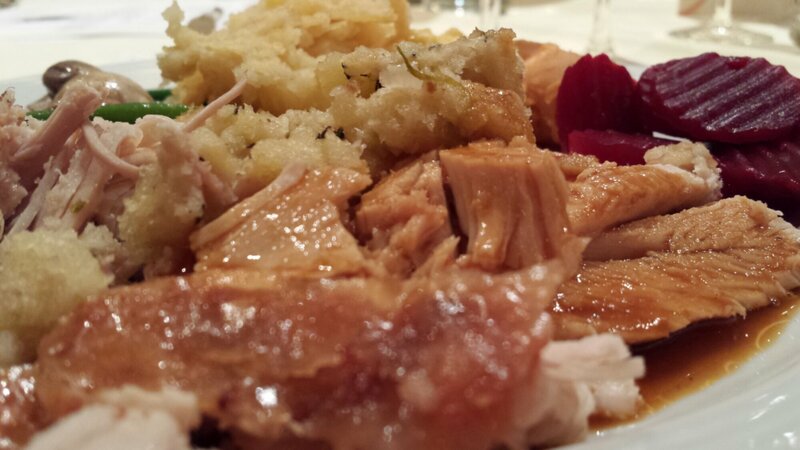 I was floored by how amazing everything tasted and how tender the turkey was, and how vibrant the colors were … Oh man. Seriously. 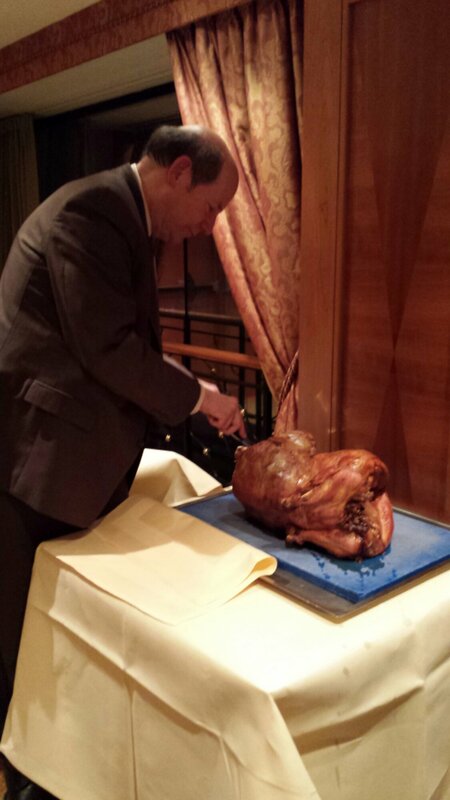 Richard from Table 9, doing a bang up job of carving the Turkey. No, I was at Table 8. No, I was not in charge. 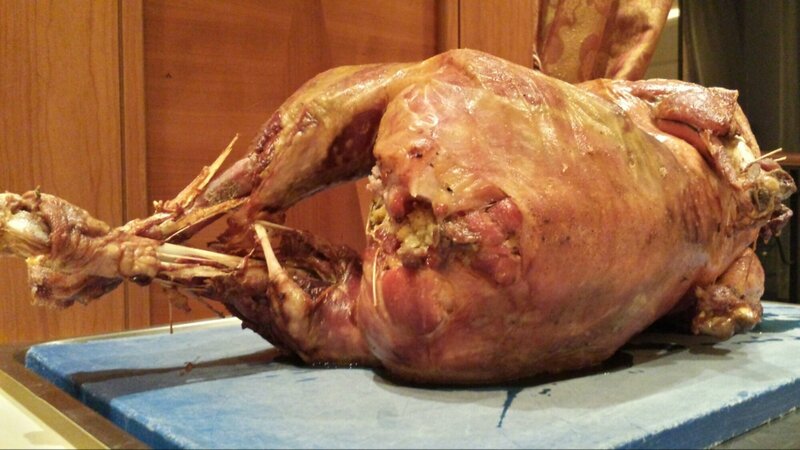 🙂 And for those non-vegetarians who want a close up view of the bird, go here: TURKEY! Apparently I was allowed to take leftovers but I kept getting distracted and forgot and by the time I was in a space to do it, the food was gone. So sad. After what felt like a million calories and two bottles of wine (the latter is probably more accurate), we were kindly … bussed. When there was nothing left to eat or drink on the table, we all went downstairs and enjoyed a lovely time at the bar! Okay, so, Saints fans, disclaimer: the people I met were from Atlanta, but they’re not into sports. Okay. Now, walking across the lobby, I heard a nice voice say, “Love your hat!” I proceeded to tell the story of my hat, and more than that, sit down and chat. We discovered we are all of the legal profession with a love of travel, food and drink. A half hour later, we exchanged emails. I made my goodnight rounds and departed at 12:12 am, because if I waited one minute longer, I would have missed my metro, which would have made me miss my bus. As it was, I had to ruuuuuuun to my stop. Arriving home at 12:50 am, I plopped into bed. But, I didn’t go to sleep right away: I had mind enough to get up and take three ibuprofen with a tall glass of water first. I’m thankful I did. All in all, it was a splendid Thanksgiving. All of my friends are super jealous, as they should be. That’s okay, though. There’s always next year. Happy Thanksgiving, NOLA. I love ya. Posted on November 29, 2013 December 19, 2013 by HumidFoodiePosted in NOLA FavesTagged ACB, Aloft, American Club of Brussels, Apple Pie, Atlanta, Beets, Bread and Butter, Carving the Turkey, Corn Pudding, Cranberry Chutney, Four Points, Gravy, Green Beans with Mushrooms, Hawaii, Keahou Bay, King Edward Toronto, Kona, Lawyers, Le Meridien, Mashed Potatoes, Mince Pie, New England Clam Chowder, Oprah, Palmer Colamarino, Pecan Pie, Pumpkin Pie, Saints Fans, Sheraton, Sheraton Brussels, SPG, Starwood Preferred Guest, Stuffing, Sweet Sleeper Bed, Turkey, W, WACNO, Westin, World Affairs Council of New Orleans, Yams.